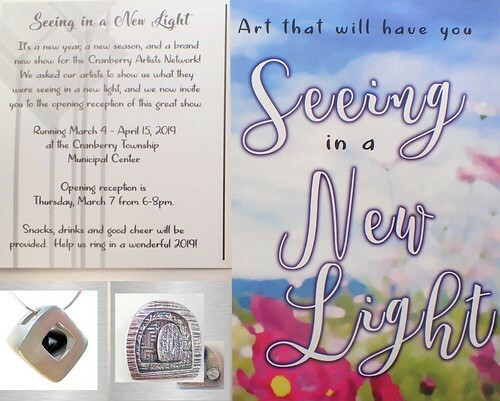 I was delighted to have two of my pieces accepted for the Cranberry Artists Network‘s Spring Show, Seeing in a New Light, that will be on display in the Cranberry Township Municipal Center at 2525 Rochester Road in Cranberry Twp, PA 16066 from March 4 through April 15, 2019. Left: Seeing the Spirit in a Cube. Could a flat-sided cube hold the spirit of a few curves deep in its heart?!! This 18 x 22 x 23 mm sterling silver pendant with “puffy cube” black onyx bead (displayed here and in the show on an 18″ sterling silver snake chain) was made in August, 2016. I’ll have to dig back through unfinished drafts: I really thought I’d at least started a post about it at the time, but can’t find it right now. I faced a number of serious challenges with that piece! If I can’t find a draft post to finish and publish here, I’ll try to recreate that story from my archived “troubleshooting notes” so I can tell that story here … eventually. I did exhibit this Cube in one other show, the 2017 Annual Exhibition of the Pittsburgh Society of Artists. It did not find a new home at that show, and has been tucked away for safe-keeping ever since. 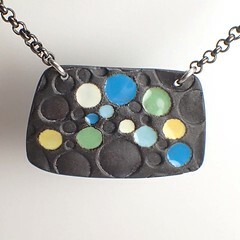 And that’s not right: this cube with it’s puffy little center bead deserves to be out and about, decorating a new owner! Right: What Is Behind Door #3 ?!! The answer to the question, shown in this little snapshot, is that you can find a moonstone back there, and it will be the owner’s choice whether to keep or to reveal that little secret when it’s worn! 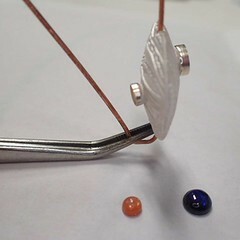 This 26 x 27 x 8 mm fine silver pendant with a 6 mm white moonstone cabochon (displayed in the show on an 18″ sterling silver rolo chain) was made in February, 2019, specifically to submit to be considered for this show. 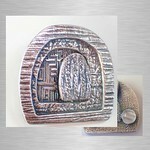 This is yet another piece in my Doorways series, which I‘ve mentioned before. I made this one out of PMC Flex which in some ways is not the ideal silver metal clay formula to use for this specific layered construction. But I wanted to make a couple more of these, I had some “Flex” I’d opened for another project, and the amount left seemed like just about the right amount, so I went with it! And with a lot of wet-finishing, supplemented by some heat-fixing so the Flex would harden up enough to do just a bit of sanding in a few places, I’m happy with how it turned out. Adding the moonstone on the back was not part of my original design but, as I worked on it, propping its little door open, the question “and what is behind that door?” kept popping into my head. I may have to explore other ways to “answer” that question in my next few Doorway pieces. But whoever ends up taking this one home will have the piece that sparked that exploration! We’ve known it was coming, watching some of the changes in the inventory and pricing that have slowly but surely changed the feel of Pat Catan’s stores over the past three years. But for the past few days I’ve been thinking about the claim from both sides, Democratic and Republican, that this could be the most important election [of some time-frame]. In some ways I would agree, with both, that it is. But not entirely. I am going to date myself here: when I was 18 the voting age was 21. Soon after I turned 21, the voting age was lowered to 18. I always felt a bit cheated by not having been eligible to vote during the elections in between those birthdays. Maybe that’s part of why I’ve voted regularly since then, including even the years when I lived overseas (pre-Internet and phone-less!) and had to travel to the local embassy to apply for an absentee ballot. I will admit that, even into my early 20s, I was still a bit naive about elections. I did vote in both “general” and “midterms” but sometimes I felt frustrated: while I was happy with some of my choices and voted eagerly for certain candidates, in other races I didn’t really like the choices and felt forced to pick between the lesser of two … well, not necessarily “evils” but at least “less than optimal choices.” Sometimes I was thrilled when candidates I’d voted for won; other times I tried to find ways to understand why a particular race had gone another way. What to do? By the time I was 26 (why that age is another story entirely) I had figured out that “the most important election” is not the General or Mid-Term ones that get a lot of hype. It is the PRIMARY that preceded it. That’s where the decisions are made about who will even be on the ballot in November! Since then, whenever anyone complains about either the results of an election or the candidates on a November ballot (especially anyone who says they don’t vote in November because they didn’t / don’t like the choices) my first reaction is, “Did you vote in the Primary?” I try to avoid getting involved in (over time, increasingly angry) arguments over the November slate. Sure, I’m happy to have intense one-on-one conversations (i.e., not via social media) about the issues and the candidates. But angry arguments, when people talk at each other rather than with each other, and often in mere sound-bites, don’t help anyone…. Informed and respectful debates, combined when necessary with elements of compromise, do help us all. Whatever the results from the election-season ending today, I am going to continue my campaign promoting the idea that the PRIMARIES are THE MOST IMPORTANT elections. Unlike the November elections, primaries are held with different rules and on different dates in different states. So outside one’s immediate community, they are a sort of moving target. No matter: please find out when yours are, and VOTE in them! Extremists do, and everyone else should as well. If you haven’t been an active participant in primary elections, they may seem a bit intimidating. It’s often harder to find good sources of information about all the candidates; for that matter, sometimes it’s even hard to find out for sure what will even be on the ballot and who-all is running! Don’t let that stop you. Here’s a hint: voting is not like a school exam: you can leave some slates blank! That’s the same as what you were doing when you didn’t vote at all, except now you can at least make some progress by voting in select races to start with! That is, if necessary, you can build up your primary-voting response slowly. Simply pick one or two races, research those thoroughly, and go vote on them! Once you’ve figured out the process, you can expand your knowledge, support, and voting for more races in later primaries. And start right away. Now! OK, the holiday-season is coming; if you must you can wait until January, but that’s all the slack you should allow yourself. Make it a New Year’s resolution, and stick with that one! And NOW means 2019. Don’t wait until 2020. 2019 may not be as “big” an election, but there will be lots of local races, and that can be an easier place to start. School boards, city / county councils, mayors, and so on often hold their elections in “off” years. Ease slowly into the primary-voting process by getting informed at least, and perhaps even actively involved, in races like those. Those are important too: not only do they involve races that are likely to have a direct impact on your life right where you are, those are often used as stepping-stones to the “bigger” positions later on. If you get to know (know about or even know personally) those folks now, you’ll be a step ahead in knowing what to expect of them when they’re ready to move up the ladder! Here’s another hint: If you don’t know what races to expect in your 2019 primary, go to the website of your state’s election services and look up the results from 2015 primaries and general elections, the year before the last (2016) general election. While there may be a few minor discrepancies (propositions change, a few votes are held on a 3-, 6-, or even 10-year cycle, etc. ), that can be a great starting point for discovering the races you can, and should, monitor. 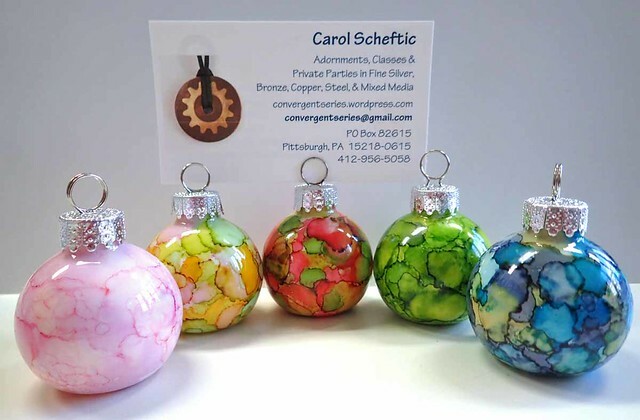 The Artsmiths of Pittsburgh Art and Cultural Center! I’m a month late in sharing this news about the Artsmiths of Pittsburgh Art and Cultural Center, but I’m still delighted to re-post their announcement. As one of their first instructors (having started teaching way back in their previous incarnation as Koolkat!) I knew this was coming, but at the time of the official announcement I was up at Chautauqua on vacation and just missed it. Why is this great news? While nothing has changed regarding location (they’re still in the big, now-green, barn-shaped building at the end of Banksville Road in Mt. Lebanon, PA), the non-profit status with APACC now provides a wider range of options both for what can be offered and how that can be promoted, especially regarding classes. just generally share Artsmiths’ information from their website or social media sites including Facebook and Instagram. I’m affiliated with several arts organizations in my local area, and I enjoy them all in their own way, but I am particularly impressed with the combination of both breadth and depth of support that Artsmiths offers to the local community. I hope they will continue strong, with more new opportunities, far into the future, and I’ll hope you’ll help in that effort too! Many other arts organizations are really struggling these days. Regardless of where you may be reading this, if there are any near you that you like, whether they are going great or struggling to survive, please remember to support them in whatever ways you can so they remain available to you and others! 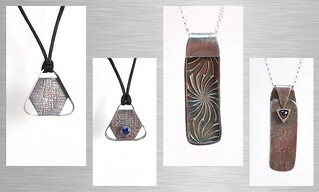 I would be remiss if I didn’t also mention that I have a workshop scheduled for Artsmiths, on making silver “Shadow Box” pendants, this coming Saturday afternoon, and as I write this several seats are still available! 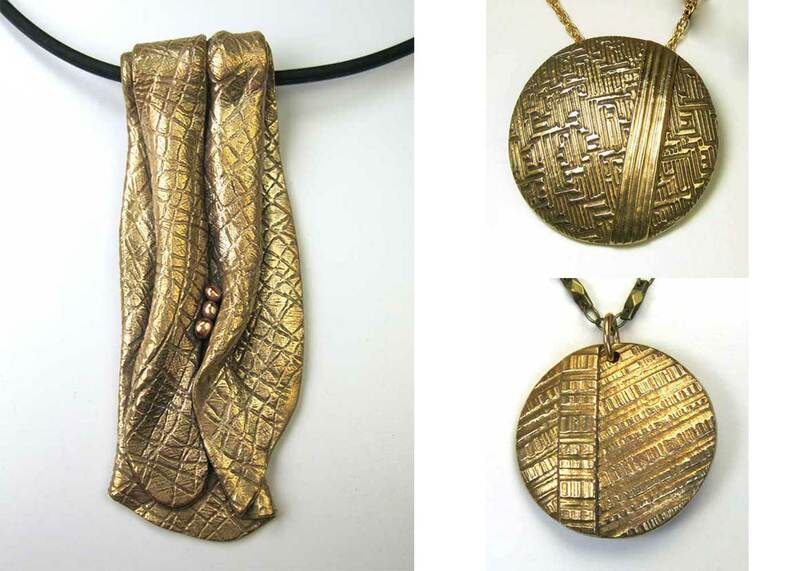 This is an amazing and versatile project: you can complete a gorgeous, reversible piece in one afternoon (I’ll see if I can add a photo in the comments), but we’ll also consider ways you could, if you want, continue to develop it after class, such as stringing your creation with interesting beads, adding sculptural wire elements, and/or even filling it with something interesting and colorful (e.g., resin, enamel, concrete, polymer clay, etc.). “Nest” workshop follow-up: tiny is in! The photo with this post shows four pieces related to a class I taught last month. The three to the left of the pencil (included to indicate size) show three of the samples I brought with me. The piece to the far right was made by one of the students. The “nest” piece to the far left is the one that was included in the venue’s printed and online catalogs. 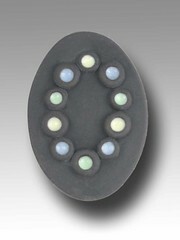 But the description said that the techniques could be used to make other designs; participants would not be limited to that exact nest design. And I took several dozen others, showing lots of different ways to apply the techniques. I didn’t have time to set up a tripod and fiddle with camera settings, so I don’t have a decent photo of what everyone made (and even the bits farthest to the side on this one are slightly out of focus). But here’s what surprised me about the class: seven out of the total of fourteen pieces that students made in that class were smaller than my smallest sample! And the one in the photo I include here was the biggest of those! Clearly, the students made what they wanted! I hope they were as happy with their pieces as I was with teaching them. 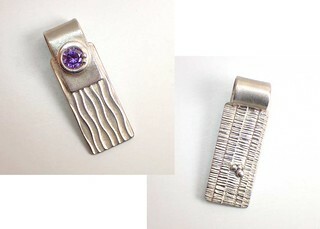 And I can go with the flow: one of the new workshops I’m now designing for the fall is tentatively called Tiny Is In! Here’s hoping for a big turn-out for a making-tiny-pieces class! Full details should be available later in August. Will you cross a river for a class? While I work in both precious metals (silver, gold) and base metals (steel, bronze, copper), my classes tend to feature silver. In response to requests for more base metal lessons, I have two bronze workshops coming up at the end of this month. Knowing the local lore of how hesitant some ‘burghers are to cross rivers, I thought I was being clever when I scheduled both of them for basically the same weekend. One north, t’other south. The thing that happened is that some people have signed up for each and, between the two, there are enough people to run a class …. but not quite enough yet to run each of them individually! 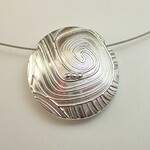 After that weekend, I’ll be back to offering workshops in silver for the next few months. 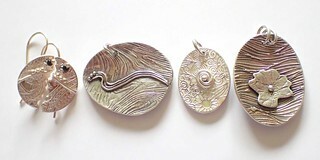 (And using silver, steel, bronze, and/or copper in the pieces I make for (lots of) fun and (a tiny bit of) profit.) If you want to learn about any of those metals, of course, in addition to my pre-scheduled small-group classes, I’m always happy to schedule a private lesson with you in my studio! Update: Good news and bad. The bad first: the Friday class at NHAC was cancelled. The good (yay! ): The Sunday one at Artsmiths is running! Since most venues (including these) don’t share participant names in advance (just the count: I get the surprise of seeing who shows up at the start of class! ), I don’t know (yet) if that’s because new people signed up after I posted this, or whether some NHAC folks did decide to go to a class on the other side of some rivers from their site. Either way, though, I’m delighted to be looking forward to a great class this weekend! A little heat wave surprise! What’s the TJ bag-lottery? You may already know, but I’ll explain it for anyone who doesn’t. Different stores (TJ’s and others), in different parts of the country, at different times, handle the issue of “shopping bags” differently. Some expect you to bring your own bags and, if you need them to provide one, they charge you for it. Others provide bags for free (or, more accurately include bags in the “overhead” part of their basic pricing! ), but give you a small discount if you bring your own bag. What a few of the Trader Joe’s around here do (and only TJs) is that, if you bring your own bags, you can fill out a little slip and, according to some schedule (I’ve no clue what that is though), they will select a “winner” and give that person a gift certificate for their store. I take my own bags, regularly fill out one of the raffle / lottery slips, and deposit it in the “treasure chest” box by the exit. 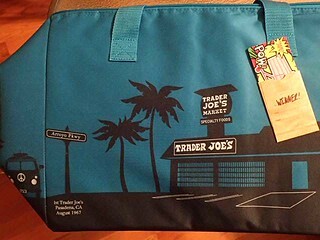 So, there I was on Monday of last week, thinking, “I’ll get one of those insulated bags if / when I win a TJ’s gift certificate.” And, on Tuesday of this week, I got a call from “Shelby” at my local store saying I had just won a $15 gift certificate! I made a special trip over to claim it and pick up one of the large insulated bags. (With tax, that was nearly half of my winnings! I so am grateful I could use it that way, and not feel I had to use it for food!) While I was there, I used the rest of it to grab a couple things I’d missed from my list when I was there this Monday. Those could’ve waited, but the bag was actually helpful for taking my contribution to a Fourth of July picnic. And, finally, now on Thursday night, I’ve found a few minutes to tell the tale. Has anything gone surprisingly well for you recently? Let’s chat about it in the comments! If at first you don’t succeed … create an alternative! Here’s something you need to know about that Quilt Show from the start: it was announced as being non-juried opportunity! 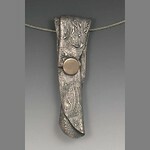 Entries would be juried for awards, but not to get into the show in the first place. The call for artists said that they’d accept entries all day each day for a week, as long as they still had room to exhibit them. So I started to design a quilt to enter. 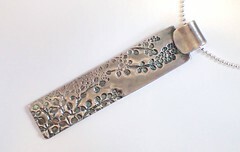 My “medium” these days is more often metal than fabric, and my “scale” is typically jewelry-size. 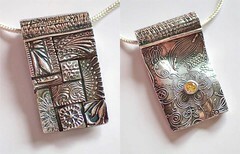 I decided to make a quilt-pendant out of fine silver, using the process of sintering powdered metal (aka “metal clay”). I would “piece” samples from a selection of different textures for one side. 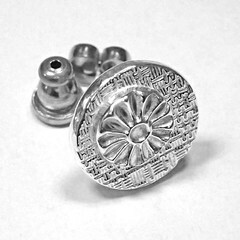 The other side would be textured with a floral pattern that I would accent by setting a small, yellow CZ into the center of one of the flowers. 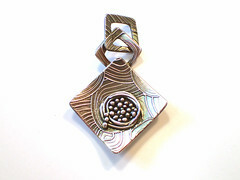 The pendant would hang by the use of an integral bail: a sort of woven-fiber pattern shaped into a “tube” much as could be used for a fabric quilt displayed as a wall hanging. And, yes, all those elements were deliberately designed as a nod to more traditional quilting! I hoped that a quilter, or quilt-lover, or quilter-lover would appreciate it during the show and decide to buy it… I also wanted to make a piece that, while it did incorporate a number of elements, wouldn’t be an exceptionally complicated piece to make: I didn’t have a lot of spare time to work on it but, even more importantly, I wanted to keep it to something that could be sold at an “affordable” price! I started it several weeks before the entry-week but, with one thing and another going on, hadn’t finished it as the deadline approached. With a lot of other things on my schedule for every day leading up to the opening of the drop-off time, my only option was to use the one and only day I’d been holding open as a “day to play” for at least a few hours. Instead, I spent all of that time, and more, playing with ways to complete the creation of my quilt piece, then firing it, polishing it, adding a patina, finding a chain that I thought would work well with it, taking a couple photographs, deciding how best to display it, giving it a name, filling out the entry-paperwork, etc. It ended up being a rather long day. But, eventually, my Yellow Flower Birthday Quilt pendant was finished and ready to go on display! The show is now on. Because I’m not naming them, I can’t promote it for them either. In this case, I figure that’s fair enough. I’ve been back, have seen the show, and am impressed with a number of the entries. I did also note that the showroom still has in place several of their usual display pedestals–empty–where it would have been easy to exhibit my quilt-piece on any one of them. But that’s all water under the bridge, as it were. But … the story doesn’t end there! 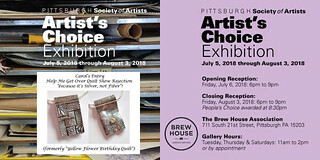 This past Sunday was drop-off day for this summer’s Artists Choice show by the Pittsburgh Society of Artists (PSA). 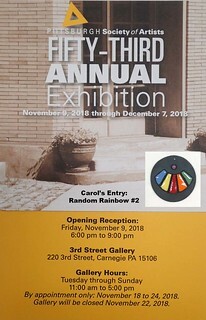 Technically, that is a non-juried show too, but one big difference is that this one is not open to everyone, just to artists who have already been juried into the PSA Guild in the first place. It’s always an interesting show. Entries may be from highly prolific artists who are always looking for show possibilities to those who only make a few pieces and seldom enter any shows other than this one. They may be new, experimental works that an artist is just putting out there to see the reaction, or pieces that just did not fit into the “guidelines” for some other show. Now do you see where this is going?! 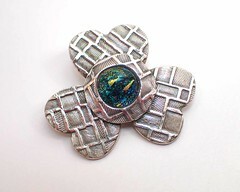 Yes, my Quilt Show piece has been renamed as Help Me Get Over the Quilt Show Rejection “because It’s Silver, not Fiber”! and entered in the PSA show at the Brew House Association (at the corner of 21st and Mary Streets in Pittsburgh’s South Side flats area). That one runs from July 6 through August 3, 2018. And I’m still hoping that a quilter, or quilt-lover, or quilter-lover will find it there and want to take it home! Regardless of where you’re reading this from, feel free to comment: Do you enter art shows? Why or why not? How do you handle it when a piece doesn’t get accepted? Or gets accepted but doesn’t sell there (especially if you let the announced theme of that show serve as a part of your inspiration for the piece!)? Nests … or should I call them Dots & Lines? “Nests” are a workshop-project that I teach every now and then. It’s scheduled again for next Friday, June 29, at the North Hills Art Center. Online registration is available. If you’re interested, please sign up asap: the last day you can register is this Friday, June 22. There are two sessions listed, for afternoon OR evening. Sign up for your preferred time, but please let someone (me or NHAC) know whether or not you’d be able to participate in the other one (in case one or the other ends up over- or under-subscribed). Having gotten the “promo” stuff out of the way, I’ll get down to the reason I decided to write a whole blog post on it: I’ll use that workshop to talk a bit about how an instructor builds up the ideas for a class. Different teachers may look at theirs in different ways, but this is the approach I favor. 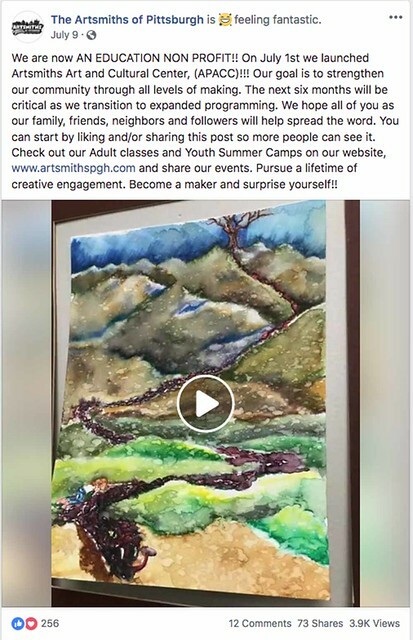 Some “consumer arts & crafts” classes are designed so that participants all make exactly the piece illustrated. Others use the image as a starting point to explore a process or technique. I tend to teach the latter, simply because those are the classes I enjoy taking the most. Of course, participants are always welcome to make something very close to the illustration; it’s just that I encourage exploration, experimentation, and creative variations too. 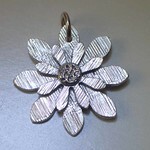 Unless noted otherwise, I try to design each workshop so it will be great for beginners with metal clay, serve as a refresher for those with limited experience, and offer specific techniques so you can continue to build both your repertoire and your local metal clay community with each new class. We start with the basics of rolling and texturing clay, cutting it into an interesting shape, giving it some dimension, deciding how to hang it, and more. 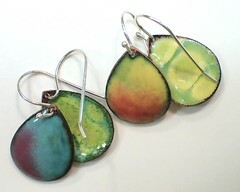 Students are welcome to make a pendant and / or a pair of earrings. What varies across my classes is what else we do each time. 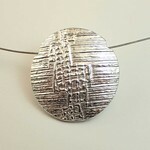 In this one, we explore ways to hand-decorate those creations with silver strings and balls. 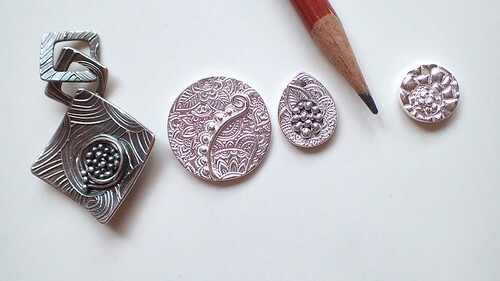 So I call the class Lovely Silver Nests because it’s really easy, and fun, to shape those into an interesting “nest” design, as shown in the first photo with this post, my usual illustration for this class. But once you know the process, you are free to arrange the strings and balls in various other patterns, instead of or in addition to nests! We also consider several ways to decorate the other side of each piece: with more strings and balls, by using more complex textures, by adding layered embellishments, and more. 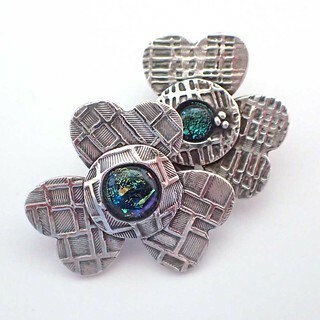 My goal is to help you create a unique piece of silver art that is reversible. 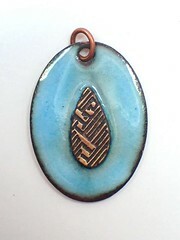 As usual, those with some previous experience with metal clay are welcome in this class too. 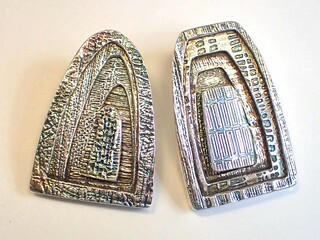 My target audience here is not folks who’ve mastered the medium and seek advanced challenges (those, more advanced, sessions are usually just held with a small group in my studio); here, it is people who are curious and interested in learning more about manipulating metal clays in their creations. They may work right along with the beginners, perhaps finding time to create a more complex bail for hanging their piece, or they may add this style of decoration to a more complex project they’ve already mastered. I’m often surprised when folks tell me how hesitant they’ve been to try these specific techniques before this class, and I’m delighted when I see the designs they come up with as soon as they’ve learned how to follow a few specific steps to make this work. So, while I call the class Lovely Silver Nests, it’s not a nest-project class. It’s a strings and balls techniques class. 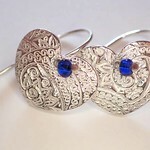 They can be used in so many ways: on some of the simplest pieces, on many very elaborate designs, and even for pieces constructed solely using them! That’s why I’m also including in this post a quick snapshot with (a) one pair of basic earrings, and then (b) the back sides (or as I tend to think of them: the simpler, other sides) of three pendants. 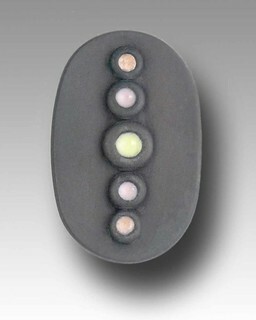 Even if you only know it as the “back” you can still know that there’s another little piece of art hidden back there! 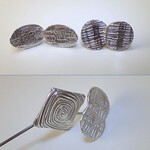 Hmmm, I wonder if I should call this workshop Dots & Lines then, or leave it as Lovely Silver Nests? I’d love to see photos (or even just links to photos) of what other folks have done with their own dots & lines! I took the challenge, and read this one too! 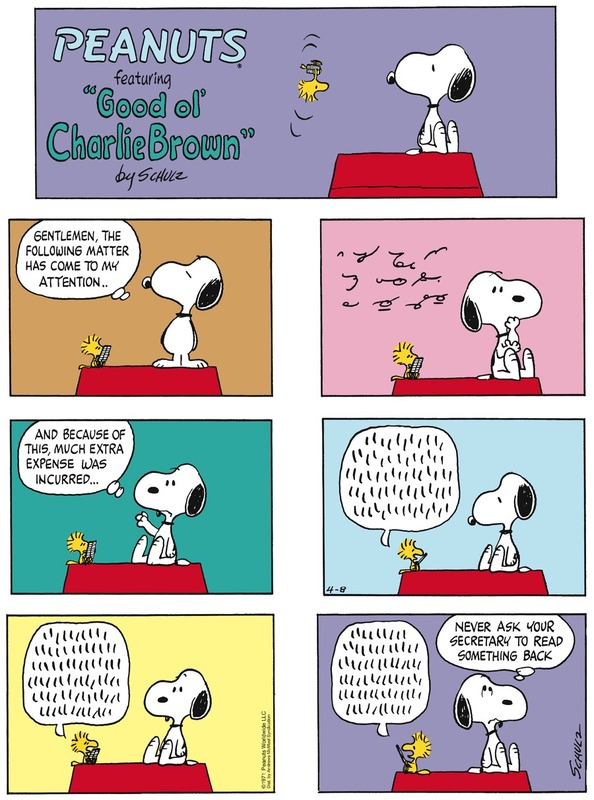 The last time I noticed some shorthand in a “classic” Peanuts comic strip, a little over two years ago, I found it easy to read as soon as I relaxed and noticed places where the “code” matched the “text” next to it. So I began to just focus on reading the symbols before I’d confirm my reading by looking at the text. And then, once my brain was back into reading that, it was easy to also decode the opening and closing parts that were not duplicated in text. This week’s strip (which I finally got around to reading tonight…) posed a little more of a challenge: none of the shorthand, though brief, was translated in the text! But, after a few false starts, I did decode it. After many years of not reading shorthand regularly, when I encounter any now I tend to start with the simplest words, just to get my mind back into that groove, and then go back to fill in the gaps. I was thrown by this one, at first, because what I initially read as “took” turned out to be “to the” and what I was trying to read as either “ear” or “year” turned out to be “your” …. Yes, part of reading shorthand does involve context! Remember when I said that I’d be holding open house Studio Sessions mostly on the second Saturday of each month? Well, April is going to have to be one of the exceptions! I’m shifting the event one day later, to April 15, which just happens to end up being the Third Sunday of that month. Yeah, well, (mathematically, modulo 7) that’s how calendars work in any month that starts on a Sunday! I’ll have a mini-show that day, from about Noon to 5 pm. 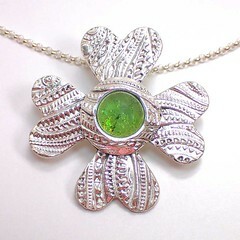 Mostly I’ll bring over pieces that remind me of spring, which is trying (with some difficulty) to arrive. 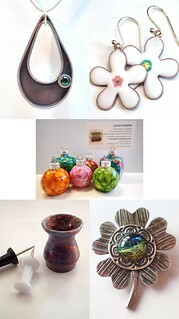 I’ll also have some other items that I think you might want to consider if you’re shopping for Mother’s Day gifts. Let me know if there are any specific kinds of pieces you”d like me to have on hand to consider. Or, if you’re more interested in making than shopping, do let me know by Thursday night if you want me to set up a place for you to work … because the only time this week I have available to do that set-up is Friday morning. If you just want to talk about techniques, or see samples & ask questions about any of my upcoming classes, you’re also welcome to just stop by any time between Noon and 5! I knew who Marjory Stoneman Douglas was! Did you?! Not even one person in my personal circle that I’ve asked recently has had any clue. The answers of my generally intellectually curious and politically savvy friends didn’t surprise me in the first few days after February 14, but as I’ve continued to ask that question in subsequent weeks, I’ve actually been surprised that not even one of them seems to have made any effort to find out, that none have seemed to have registered the occasional reference to her that has been slipped into media coverage. (And neither do they seem to remember the second-season episode of The Simpsons that referenced her! Though I’ll admit that even I had (a) seen and then (b) completely forgotten that one until I went looking for something like that “place to start” link above…) In this era where people pull out their “phones” to look up anything, are my dear friends suddenly so distracted that they cannot take a minute to question who she was? I have been truly baffled. If you have any thoughts on MSD, please feel free to share them in the comments for this post. I keep telling myself “Don’t Panic,” as shown in friendly yellow-on-orange letters on the button illustrated here (and in friendly orange letters, below) but I can’t believe how oblivious I recently was. Had I just come back from California sicker than I’d realized? 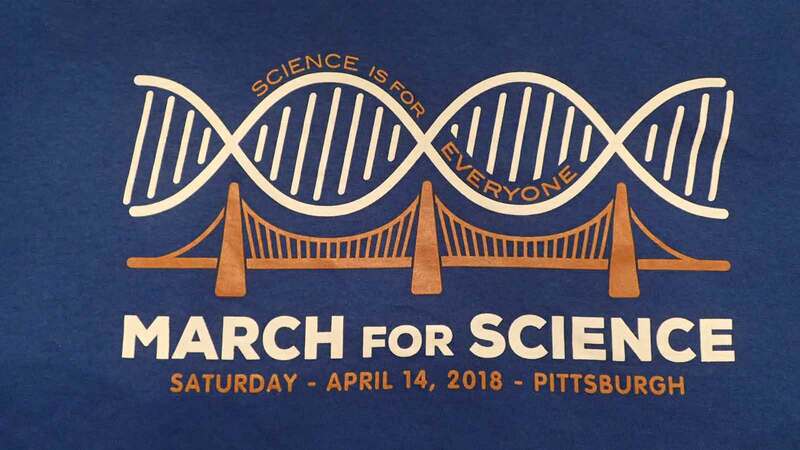 Otherwise, how did I completely miss all the connections until this weekend?!! I mean, there I was, on March 8 of this year, among other things in a sort of hexagonal phase, nattering on about Kepler and his various hexagons, and I totally missed another connection to them. OK, so the hexagons were merely a side-comment on a note about planetary motion, but that means I missed connections to both hexagons and intergalactic travel for that very date, March 8, 2018: it was the 40th anniversary of the first broadcast of The Hitchhiker’s Guide to the Galaxy! One of the Don’t Panic buttons shown with this post came with my copy of the old IBM DOS game. But maybe I should back up a bit: I’m a huge fan but I’m definitely not a complete HHGTTG geek. (Well, those who came to my big HHGTTG Hallowe’en party back in the mid-80s may argue that point, but I know others who’ve gone far deeper into it than I ever have! For example, both the individual button and the game that included the other one shown here were gifts from folks who’d enjoyed that party.) My primary affinity has always been to the radio / audio pieces! But the thing you may not know is how the HHGTTG led me to spend years and more years (nights and weekends, on top of my “day” job) ensconced in windowless rooms involved in an art form with ZERO visualization. Yep, the HHGTTG led me to a side-career in Radio Theatre, with the WYEP Radio Theatre Company! I joined with the very first production as sound man (sic); within a year I moved on to technical director; eventually I added the roles of producer and occasional acting director too. Our half-hour shows ran on Sunday nights from somewhere in the mid 1980s through around the end of 1992. We produced both single-night shows and multi-week series. The folks at WYEP were incredibly supportive, alternating the airing of purchased shows with our series, thus giving us time to research, rehearse, record, add effects, edit, mix, and finalize our productions, all in our “spare” time! A couple of older actors (then probably around the age I am now…), ones who had actually worked in radio theatre in the 1940s and 50s, started the group at ‘YEP. This was a few years after the HHGTTG first aired. The first call went out in December (of the month I am sure: I was supposed to be back home in Florida then but, unexpectedly, had been forced to skip that trip over a work deadline, which is the only reason I caught the call) in I think it was 1986 (which sounds right: I first volunteered at ‘YEP in 1976, where I learned and then taught production techniques to new volunteers, but I had to cut back when I started a job I held in 84-85; ‘YEP was off the air for a while then too, part of which involved a move from Cable Place to Chatham). After a year or two, for various reasons, those guys gradually moved on. There was a diehard crew from the beginning that helped keep it going, bringing in various other colleagues both to add range to our company and to help increase our flexibility in scheduling. It ended pretty much when I decided to move to California. (And a faculty member at Carnegie Mellon who taught script-writing for the drama department and provided me with a lot of moral support in addition to the occasional script decided to move to a different part of CA at the same time…) While others would have continued to participate in it, and the friend who helped me with the technical director duties would likely have continued that for at least a while longer, no one stepped up to take on the overall production management that I’d also done. The whole thing had been a labor of love by a great team of volunteers. I tried, without success, to obtain some major grants to support our efforts. But I did manage to get the station enough money to cover our direct costs (e.g., rights, tape reels, snacks, etc.) and to provide any volunteer who wanted one with a cassette copy of a program on which they’d helped. Yeah, this was back in the dark ages of splicing recording tape with sticky tape, and distributing copies on cassettes! Later, my reaction at the moment I first heard about Apple’s music download service, was, “If I only had a place to create Radio Theatre now, could this be a way to try to distribute and fund it?” Producing audio theatre was, for years (until I started doing this art-jewelry thing!) my alternative-career fantasy. I don’t have plans now to go into podcast production, but I am delighted that all this is continuing in one form or another. Such fun! At last, here’s a link to the newest production in the HHGTTG universe, where on March 8, 2018, on BBC Radio 4 they aired Episode 1, titled (note the connection that started this rant…) Hexagonal Phase! It seems to be available without geographic restriction, but only for 30 days from air-date: so if you’re a fellow HHGTTG-fan, do catch it while you can! December 22, and I can’t believe I was out in my PA garden again this year! Last year, I reported on mowing my lawn on December 27. This year, predictions are that we will have snow on the ground for Christmas, with highs in the high 20s (Fahrenheit) and lows in the mid teens then and into the rest of that week. But yesterday, December 21 (aka Winter Solstice), the temperature reached around 50. Today it headed well into the mid 50s. Even warmer than last year! I’d planned to go into my studio but couldn’t resist the urge to spend both afternoons in the back yard, wearing just sweatshirt, jeans, and boots. And very heavy suede gardening gloves. I had some black raspberry bushes that I’ve been wanting to take out. I do love the berries—when I can salvage some that the birds leave me—but keeping them from spreading everywhere had just ended up being far more work than the berries were worth to me. I’ve been saying for few years that they had to go, that I’d dig them out in the fall. Then I’d get busy, not get to them beyond maybe a bit of pruning, and the next year it’d be, “Well, the bushes are there. I might as well enjoy another year’s harvest, and take them out this fall.” I’d spend some time during the summer trying to stop new runners, and promising myself they’d all come out after I was done harvesting. And then I’d go into busy-season and…. So, this week with warm temperatures and soft, moist ground, it was time for berry-bush-removal! I wasn’t counting, but I think I took out about 15, and cut them into small enough pieces that city-trash will take them. Half were picked up this morning; the ones from today are bagged up and will get put out for next week’s collection. There are two left that I didn’t get to before dark (though sunset has already started getting later, I just didn’t have quite enough daylight to finish those). But the ones I chose to leave are, deliberately, those in the least-convenient locations, so I hope that will convince me to complete the removal at my next opportunity! I’m almost there, though those last two may just stay where the are until spring…. Now what I have to do is to decide what I’ll put into the spaces where the (overcrowded!) berries used to be.